DISCOVER TAJIMA >Hot Springs	>Ikuno Keikoku "Kurokawa Onsen"
Deep in the mountains, at the foot of the rock filled dam “Kurokawa Dam” is Kurokawa Onsen. 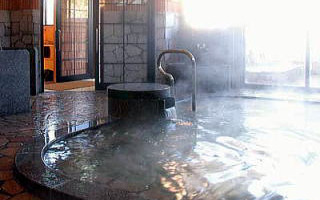 The onsen’s hot spring water is a simple alkaline type spring that sprang from the flower garden of the famous temple “Daimyoji” neighboring to the north. The hot spring water has a viscous consistency that is gentle on the skin and leaves you feeling refreshed upon stepping out of the hot spring. Take your time soaking in the waters for the utmost relaxation. Holidays: Wednesdays (unless it’s a national holiday).